A broken link on a webpage is perhaps akin to an obscured roadsign. We might well miss our turn, but the destination might still exist and our friendly sat nav or google maps can still find us a new route as to where we want to go. It might be a distraction, but it definitely doesn’t stop the journey. Whereas when you embed content – say an iframe or a video – then that content going away really does break up the educational content. It’s much more of a “bridge out”. 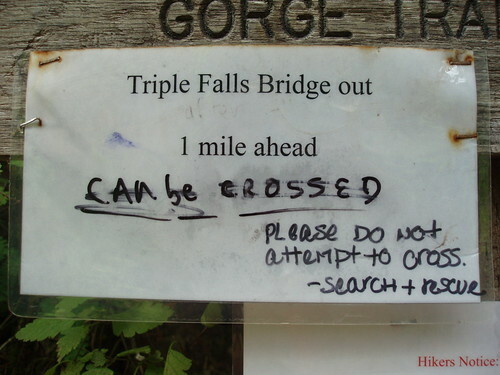 Your sat nav is going to need to know the bridge is gone, and then find a new route for you completely. With Great Writers, and OER websites in general, there is a requirement to make the content reusable. Now, we can argue downloading one of our podcasts or videos is a reuse case, but is that enough. We have on our development site got embed code working for our materials, but the embed code, like youtube embed code relies of a URL to provide the video and the audio back. I’d assume that an embed code is easier to use than download and uploading would be, and also it perhaps offers reuse statistics for the producer of the materials. So embed is useful, if not always better as an option. But when we provide an embed service, do we then take on a greater level of responsibility. We become part of someone else’s educational material, and so need to make sure we don’t jeopardise that. URLs clearly don’t live forever, maybe there is a case for OER handle URLs (a sort of OER LOCKS service). Perhaps we could argue a case that Jorum could store all ukoer URLs, and so should a URL die, people could refer there for another version? We obviously want our content to be reused, and also, perhaps to have evidence for reuse – to which an embed code is ideal. But then we accept that this is a high risk for us as people might wonder, or may well find out that the content disappears. The case for OER – remix / reuse / stats versus permanent hosting places us between a rock and a hard place. We want both, but we might have to chose one over the other. Once HTML5 becomes more mainstream then embedding will become so much easier, but it still places a dilemma on OER sites as to what to do, especially if only short-term funded.